Dr. Ahmed Chadli and fellow researchers at the Medical College of Georgia believe that they are on the right track to finding a new cancer treatment using celastrol, a plant derivative derived from trees and shrubs called celastracaea that the Chinese have used to treat symptoms such as fever, chills, and inflammation for centuries. Dr. Chadli and his colleagues think that they can devise a way for celastrol to be used for cancer treatment by using it to inactivate P23, a protein required for cancer growth. Normally, P23 is a chaperone protein aiding the heat shock protein 90 (Hsp90). Hsp90 has many chaperone proteins for its many different functions, and it is challenging for researchers to find a chaperone protein that will selectively target the Hsp90 implicated in a specific tumor. The MCG researchers believe that celastrol has the specificity to control cancer cell growth by forcing the Hsp90 to cluster together, inactivating it. “Cancer cells need Hsp90 more than normal cells because cancer cells have thousands of mutations. They need chaperones all the time to keep their mutated proteins active. By taking heat shock proteins away from cells, the stabilization occurs and cell death occurs,” explains Dr. Chadli. 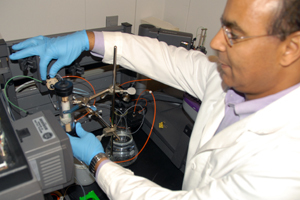 Dr. Chadli researching in the laboratory. Dr. Chadli is a researcher and professor at the Medical College of Georgia and an alumnus of the Mayo Clinic. He has been researching Hsp90 for over 10 years and has several works published in The Journal of Biological Chemistry and other journals. He conducts thorough research to understand the intricacies of all the molecules and pathways associated with Hsp90. Cancer therapy can be greatly refined with ambitious research like his. Dr. Chadli looks forward to future studies on cancer patients with greater dosage of celastrol, hopefully leading to greater results in the therapy.